Each time you make a reservation through this website, your reservation is made directly with Jewel Apartments. As such, you are guaranteed the lowest possible rate, unlike reservations made through third party systems (whose prices include the given platform’s commission). To view rates, availability and make an online reservation directly with Jewel Apartments click here! Jewel Luxury Apartments Mykonos is found on the beach of Ornos. One of the most beautiful and well-organized beaches of Mykonos with easy access, which is ideal for children. Jewel Luxury Apartments Mykonos is close to everything, tavernas, restaurants, bar, beach bars, supermarkets... It is only 2km from Chora (Mykonos Town) and 300m from Ornos beach. There is a bus stop with regular transportation, boat service for easy access to other beaches, taxi service and scooters, ATV, car-hire. Free parking is also available. It is a new complex dating from 2015, which is made up of spacious apartments,(50-55sq.m.) which are fully equipped with all modern amenities. Each unit has two rooms: a bedroom with a double bed and a large living room with 2 beds, dining room and kitchen with all the necessities. The large ceramic tile bathroom has a bath/shower, as well as a built-in sink and hairdryer. There are also private verandas in front and the back, with table and chairs. Each unit can easily accommodate 4-6 people. 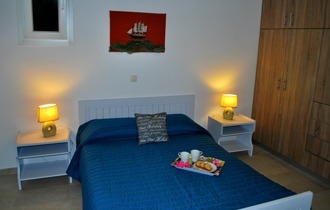 The complex also features 3 fully equipped apartments, 75sq.m. each with two bedrooms and a double bed in each, and a sitting room - kitchen. 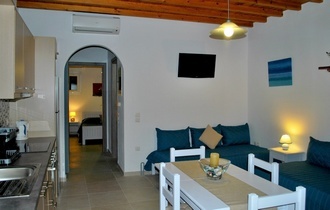 Each of these apartments can accommodate 6-8 persons. Bobby and Voula are always available to help you enjoy all their services, such as transportation to and from the airport or port, excursions, car/bicycle hire, bus and boat timetables and other information pamphlets. We guarantee to provide you with the most comfortable and unforgettable holidays ever.